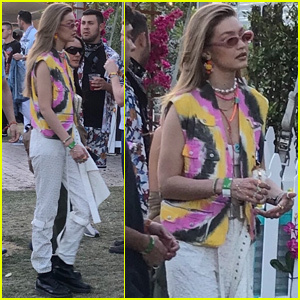 Bella & Gigi Hadid Go Bright & Bold for Anna Sui Fashion Show! | Bella Hadid, Gigi Hadid, Kaia Gerber | Just Jared Jr.
Bella Hadid struts her way down the runway as she walks in the Anna Sui NYFW Show on Monday night (February 12) at Spring Studios in New York City. The 21-year-old model right two bold outfits for the show, where she was joined by older sis Gigi and Kaia Gerber. Bella kicked off her day by walking in the Ralph Lauren fashion show alongside younger brother Anwar. After the show, Gigi and Bella were spotted heading to Gigi‘s apartment after their busy day.